Tankless water heaters are gaining popularity within the United States, but how do they work? Tankless water heaters – also called “demand-type water heaters” or “instantaneous water heaters” – provide hot water when needed. These are more beneficial than traditional hot water heaters in that they do not result in the energy losses that occur as a result of being a standby hot water source. They do not result in loss of hot water once the standby hot water has been depleted from the tank. There is absolutely no storage tank on a tankless water heater. Instead, there is a unit that includes either a burner that utilizes gas or an element that is powered by electricity. When a hot water knob is turned on within a structure, the water moves through a pipe and goes through the tankless water heater unit. It has the unique capability of providing constant hot water; however, the tankless unit does have an output rate that limits the actual flow of water that emerges from the system. According to averages, tankless water heaters are able to produce up to 5 gallons of water each minute of use. In those units that utilize an electric element, the output rate of water flow is lower. Gas burner units have faster flow output. If you are interested in having a tankless water heater, but use a lot of water at once – for example, washing clothes and using a dishwasher at the same time – you may overcome the complication of low water flow rates by having multiple tankless water heaters installed within the structure. 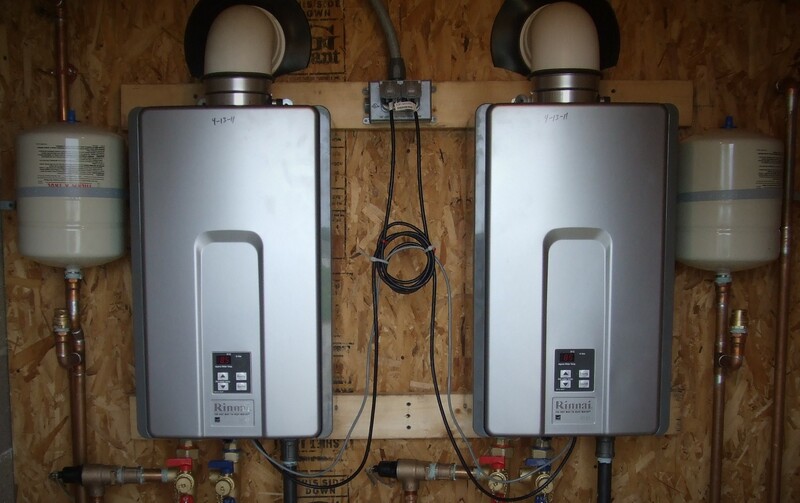 These types of hot water heating units provide a low-cost solution to energy savings within homes and other types of buildings. In order to obtain these, you only need a line that is designed for cold water flow and an electrical hookup. If you prefer the hot water systems that utilize a gas burner to heat up the water, you will also need a gas line that runs into the home. Traditional storage tank hot water heaters often require expensive piping and specialized valving units. Furthermore, they use a lot of electricity or gas when keeping the water within the tank constantly heated. Tankless water heater units require low maintenance. Water is consistently flowing through the unit; therefore, it is capable of self-cleaning. There is no buildup of calcification and alkali. This aids in reducing the possibility of corrosion from occurring. Operational costs are typically much lower than those associated with traditional hot water tanks. This means that the system will last longer, with fewer complications; therefore, tankless water heaters will have a significantly longer life than the conventional heating storage tanks utilized throughout history. If you are ready to update your water system and have an interest in tankless water heaters, contact us at Reynolds Plumbing, Inc. today.